Practice Area: The renovation included upgrades to the now 10-acre practice area with a dual-sided driving range and a short game practice area with a sand bunker. The practice facility is now top-notch and one of the nicest public ones around. 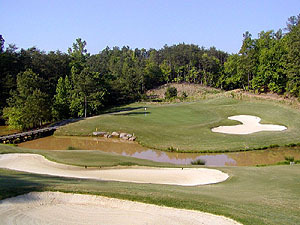 The course offers practice memberships. 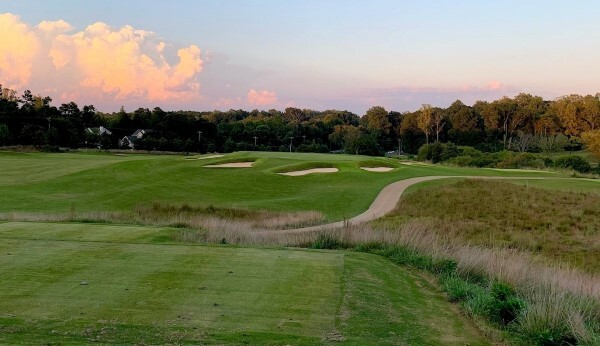 Description: Formerly the Mooresville Municipal Golf Course (and originally a 9 hole Donald Ross design that opened in 1948), the course now known as Mooresville Golf Club completed a $5 million renovation by Kris Spence in 2016. The current course features a new layout with a links style golf experience. The upgrades include: TifEagle bermuda grass greens, 70 bunkers, 5.2 miles of concrete cart paths, a dual-sided driving range and short game practice area. Notes: Affordable membership options start at $1000 annually. The club features a 17,000+ sq. ft. club house (opening August 2017) complete with restaurant, snack bar & grill, pro shop, outdoor seating and garage facility to house golf carts with top of the line GPS systems. Banquet space will accommodate 150+ to host special events including weddings, meetings, large tournaments and other gatherings. B-Man's Take: I played the renovated layout for the first time in August 2017. The new bermuda greens are excellent and very challenging, though they are still young and not holding approach shots well. It pays to have some local knowledge and experience of each hole so you know the right targets to shoot for. The course is very walkable and reasonably priced for the quality of conditions and amenities. It features 5 par-5's and par-3's and plenty of scoring opportunities. There are several really unique and fun holes, including the par-4 downhill #4 that leads right into the clubhouse and parking lots -- careful you don't go long! The 9th hole par 4 is another hole that features a dramatic elevation drop then a long, tough approach over a creek to the green that's backdropped by the clubhouse. On the back nine, the long uphill par 4 17th is a brute. Overall this is a challenging course with tricky greens that is kept in great shape. 5/27/18 - Msg Board Posting by BetterThanMost titled "The Hits Just Keep On Coming"